According to a September article in Modern Healthcare, occupancy at skilled nursing facilities across the United States reached a record low of 81.7 percent in the second quarter of 2018, down from 83.1 percent in the second quarter of last year. It stated the Affordable Care Act has steered consumers away from hospitals, SNFs and other inpatient settings by rewarding new care models that facilitate primary and home healthcare. Interested in if our therapists were seeing a similar downslide, we talked to both Mary Ireland, PT, team lead at Spurgeon Manor, a skilled nursing facility in Dallas Center, Iowa (28 miles from Des Moines) and Courtney Hulett, PT, rehab director at Lake Regional Health Center in Osage Beach, Missouri. Marketing can be challenging for therapists. They tend to (rightly so) focus more on the clinical execution of their skills and less on promoting them. But if therapists set aside a couple hours each month to focus on marketing the skills and programs in their departments, they’d see an uptick in their caseload. RehabVisions and Total Rehab formed a partnership to provide management and support to Total Rehab’s two existing Outpatient Clinics in May 2013. I’m a thank you card person. I know, it’s becoming outdated and that makes me sad. I recently read that a quick email or text is accepted as an adequate form of thank you because of its timeliness. I’m trying to get on board with this idea, but I still love putting pen to paper. What’s not going out of style, and hopefully never will, is the act of saying thanks. And the act of recognizing people who are doing well in their work. Hospital Compliance Manager Brenda Kemling, PT and Assistant Director of Operations Bill Mannewitz, PT attended the APTA Combined Sections Meeting last week in New Orleans. The three-day event is an opportunity to gather for the country’s largest conference on physical therapy. Incidentally, Bill ran into Cory Ash, PT, assistant manager for RehabVisions Outpatient Clinic in Dickinson, North Dakota, in one of his sessions, so RV had more representatives than we even realized. Any individual pursuing lifelong learning will keep the doors of opportunity open throughout his or her career. Being involved in professional organizations is a great way to live out this concept, allowing for personal career development and the formation of valuable relationships. Director of Operations Steve Kinkead, SLP and Area Manager Jean Herauf, SLP attended this year’s ASHA (American Speech-language Hearing Association) Convention in Los Angeles this past week. This year’s theme was “Focus on the Big Picture,” and more than 14,000 professionals were in attendance for the three-day event. Cariant Health Partners, RehabVisions’ sister travel company, started in 2001, mainly to assist in staffing RehabVisions’ short-term needs. It has since grown to 17 home office staff, and they recently added a nursing division. Similar to RehabVisions’ roots, Physical and Respiratory Therapy Services (PRTS) was founded by a therapist to serve rural communities. Assistant Manager Cory Ash, PT is a great example of someone who has built strong relationships with medical providers in his community. Cory, who has been with RehabVisions Outpatient Clinic in Dickinson, North Dakota for 11 years, said the relationships he’s built are consistently strengthened because of good patient results. “I think a lot of trust comes from just taking really good care of patients,” he said. Cory’s genuine care for his patients is obvious but he has also taken other steps to cultivate relationships with physicians and other referral sources. He attends continuing education opportunities put on by local physician groups and takes advantage of the social time to get to know doctors more personally. Having grown up in a city like Omaha, Nebraska, I don’t understand small-town living. When I hear the population sizes of some of RehabVisions’ rural locations, my reference point is my high school–we had 2,400 students in four grades. “That’s about the size of my high school or two of my high schools,” is what I’m thinking, and I try to imagine what life would be like. I can sort of comprehend the knowing-everyone-in-the-grocery-store phenomenon as my neighborhood is pretty tight, and I feel like I know everyone sometimes. But having everything I need and know within a few miles is something of a mystery to me. After a year and a half of lead-up, we were so excited to finally participate in APTA’s National Student Conclave this past Friday and Saturday in Omaha. RehabVisions was represented at the trade show as we doled out the world’s best ginger snaps and met bright PT students from all over the country. The acquisition of Ernie Geiger’s PT practice and clinic in South Bend, Washington was complete in February of this year. He and his wife, Diane, who had run the business for 30 years, intended to take a week off after the closing before Ernie would return to doing home health therapy in the area. They ended up taking a month because they were enjoying themselves so much. Six weeks from his own bilateral hip replacement and Gary Scott, PTA, who works for RehabVisions at an Iowa hospital, has seen things from the other side. “It was good on-the-job training,” he said. Last week 35 of RehabVisions’ hospital and clinic rehab directors descended upon Omaha for our annual meeting. The time together started with a casual Sunday dinner to welcome everyone back, introduce new managers, and allow our more seasoned directors to catch up with each other. 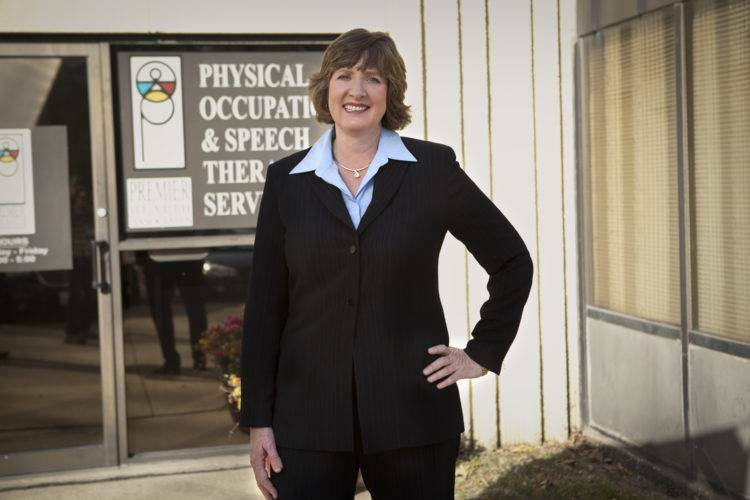 Lynn Janssen, SLP owned and ran Premier Health Associates in Des Moines for more than 18 years when she sold her company to RehabVisions in 2010. We acquired from Premier five SNF contracts, one hospital contract and Premier Health Associates clinic. The companies blended easily because of the shared values and philosophies between them. Likewise, the 35 employees who transitioned to RehabVisions through the acquisition were the type of people we hire ourselves. “They have a genuine concern for patient care and a dedicated focus to do whatever is necessary to get the job done,” CFO Darrell Metcalf said. Interested in exploring a buy-out or partnership with RehabVisions? Contact us to start a conversation. RehabVisions welcomed its rehab directors and team leads from our skilled nursing communities last week. The group of 18 gathered in Omaha to join their peers in leadership development, clinical and compliance training. The meeting kicked off with a welcome video introducing staff at the home office. It was the first of several as each rehab director/team lead was asked to introduce their community and staff through a short video submitted before the meeting. The videos served as icebreakers and entertainment between presentations. RehabVisions added a new position to our Operations Department recently to to stay on top of regulatory points and provide expertise to our hospital clients. Brenda Kemling, PT started in her role as Hospital Compliance Manager in June. So far, she has been training RehabVisions’ hospital staff on Functional Limitation Reporting (G-codes with severity modifiers), completing chart audits, and assisting in the establishment of electronic medical records in all of our facilities. May marks the 30th year that RehabVisions has been in business. To commemorate this important event, we put together this video about how we started, where we’ve been, and what the future holds for us as a company. Enjoy! When Bethany Lutheran Home CEO Mike Van Sickle went looking for a new therapy provider, integrity was number one on his list. Bethany Lutheran had been caught up in a costly, multi-year Corporate Integrity Agreement from the Office of the Inspector General relating to their previous therapy provider. They were investigated for their billing practices. “We didn’t have the sophistication or the experience to know it was happening,” Mike said. I love the feeling of fresh beginnings from starting a new calendar year. I’m a resolution-maker, and I think others should be too. It’s a perfect time to assess how things are going and set some goals that you can actually track in the coming year. It’s 90 degrees in Omaha today but that didn’t stop some of our home office employees from enjoying a mid-day walk in celebration of National Walk at Lunch Day. What’s Awesome About Occupational Therapy? What’s not awesome about Occupational Therapy, right? 🙂 Well, let us know. To celebrate Occupational Therapy Month in April, we’re hosting a little contest for Occupational Therapists and COTAs. Tell us in 50 words or less what is great about Occupational Therapy or why you became an OT/COTA, and you can win money!